Stamp with Me: Happy New Year - Sale-A-Bration is here! Happy New Year - Sale-A-Bration is here! It's been a while since I've written (no excuses) - Christmas and travelling interstate kind of made life busy for a while. Can you believe it's 2009 already! Seems like you blink and another year has gone by! I just look at my 2 boys and know that time is going by fast. In a few weeks, Big Boy Luke will be starting school and another chapter in our life begins! Lots of news on the Stamp with Me front! Firstly, it's Sale-A-Bration time. That's right! The wonderful time of the year where we (customers, demonstrators, hostesses and recruits alike) are rewarded with exclusive stamp sets! The new sets this year are just gorgeous and like previous years - they are limited editions and exclusive to this event! Don't miss out! Select any one of the stamp sets in the Stampin' Up! Sale-A-Bration 2009 catalogue free with a purchase of $100*. There is no limit! For every $100 you spend, you can choose a free Sale-A-Bration set! Don't miss the opportunity to own these exclusive sets. Sign up to be a Stampin' Up! 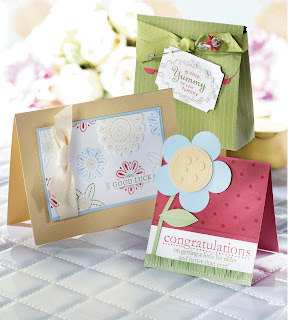 demonstrator during Sale-A-Bration and select any set** (value up to $79.95) from the 2008-2009 Ideas Book & Catalogue free! Click here to see the on-line version of the Stampin' Up! 2009 Sale-A-Bration Catalogue. Special offer from Stamp with Me! A very special new year offer from Stamp with Me! All orders made during the first two weeks of January 2009 will receive a special treat from Stamp with Me. Offer applies to all orders made before January 15, 2009. Join in on the fun! This offer is exclusive to Stamp with Me. Contact me now for more information on the special offers you can take advantage of!